In our gender diversity practice, we are aware how cultural stereotypes influence our views and behavior. Ever wonder why we remain so conflicted about women achieving parity in the executive suite? 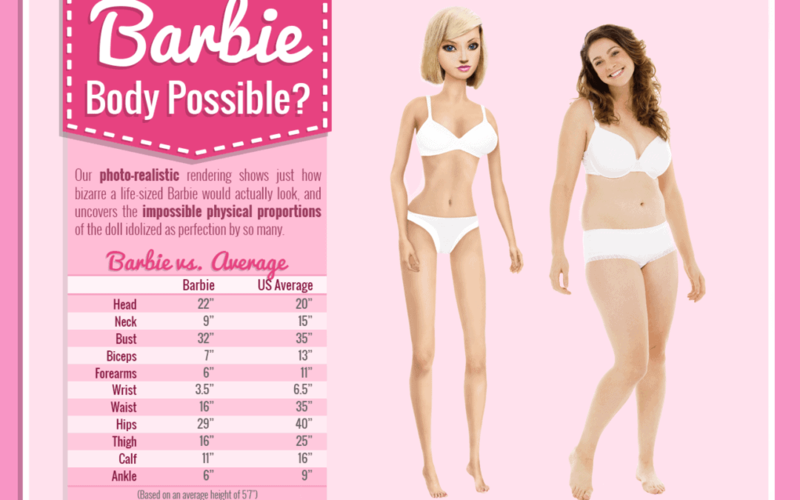 Take a close look at Barbie and think about how warped her physical dimensions are. She is so thin that she’d be classified as anorexic. In fact, her dimensions literally would cripple her. If Barbie were real, she’d have half a liver because her waist is so small. With so long and narrow a neck, she’d be unable to lift her head. Moreover, she couldn’t stand — it would be physically impossible with her teensy-weensy child’s size three feet in the permanent high-heel position. She’d have to crawl. Every two seconds, a Barbie is sold. Every year, 15 million dolls make their way into the hands of little girls. Too few of them grow up to be CEOs. While a the iconography of a single doll seems trivial, it is not when it has served as a role model for our daughters for more than fifty years. Rehabs.com, which published the infographic below, points out that four out of five 10-year-olds say that they’re afraid of being fat. 42% of girls in first through third grade wish they were thinner. And, half of girls aged 9 or 10 claim that they feel better about themselves when they’re dieting. On January 1st of this year, we achieved a new milestone when the number of female CEOs in the Fortune 500 rose to 21. The number represents a paltry 4.2% when parity would be 50%. Though there are many contributing factors,Barbie is so imbedded deep in our psyches that I suspect the number of female CEOs will not change until Barbie does.